WorldChanging points to a review of the Eliica, an 8-wheel, all-electric concept car that punches it from 0-60 mph in four seconds. The Eliica—short for Electric Lithium-Ion battery Car— was created by Hiroshi Shimizu and the Keio University Electric Vehicle Laboratory in Tokyo. 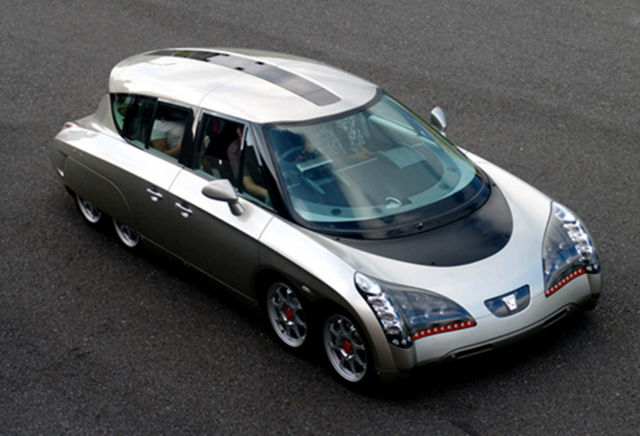 The fifth electric concept vehicle coming from Keio, the Eliica is the immediate successor to the 8-wheel Kaz (Keio Advanced Zero-emission vehicle) limousine, also a product of the Keio laboratory, and the foundation platform for future 8-wheel work. The Eliica uses 8 60kW in-wheel drive motors to provide the equivalent of 800 hp. 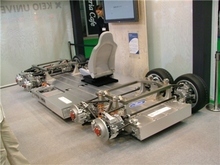 The photo to the right shows the exposed platform and wheel units. The Keio in-wheel drive units eliminate the need for the power-transmission devices connecting the engine and the wheels that are necessary in conventional cars. The motor, reduction gear, wheel bearing, and braking system are integrated in a single unit, and the suspension arm adapter is attached to the outer motor casing. Because all the wheels are driven, spin is minimized and the vehicle can be easily controlled, even under difficult road conditions. One of the two models of the car hits 0.8G in acceleration. The car has recorded a top speed of 370 km/h (230 mph), although Shimizu says it could hit 400 km/h (250mph) in the correct conditions. At this point, the Eliica requires 10 hours to charge fully and carries a hefty pricetag: some $320,000. But current hydrogen fuel cell cars aren’t all that cheap, either. “When you’re dealing with technology thought by most to be slow, heavy and lacking range, you must do better than any supercar,” [Shimizu] said. The use of the in-wheel drive originated at the turn of the last century with Porsche (earlier post). That approach is resurfacing in a number of other electric concepts, including the Peugeot Quark. Vwry efficient car, a greenmobile in my eyes. Good use of energy, no pollution, no gas, who wouldn't want such a car. take a look--hit 'click here first' at the beginning. Its in the trillions of dollars. Future transportation. i have new idea for your car. why not add small bio-diesel gen to run and use less battery weight ? What is the weight of the Eliica? This is as important as the speed of it. At 60mph, how long does it take to stop, how many feet?